Lost In The Warp: With a little help from... Kirill Zhilkov! With a little help from... Kirill Zhilkov! Back to the beasts! This weeks helping hand comes from the incomparable Kirill Zhilkov. We met through the Golden Demon Lounge organized by myself and a few others for Games Day events a couple of years ago. Kirill is a great guy, really awesome to talk to and has a great deal of insight into miniature painting and modelling. I think what I like best about him and his work is that I can see in him the same desire to grow and pursue this art form as I have. Equally willing to teach and to learn, Kirill approaches each project with a willingness to challenge himself and a fantastic eye for detail. He also has a blog that is a little sparse and not often updated, but when it is he really shares some great stuff. It is worth subscribing to just for the notifications when he does add to it. 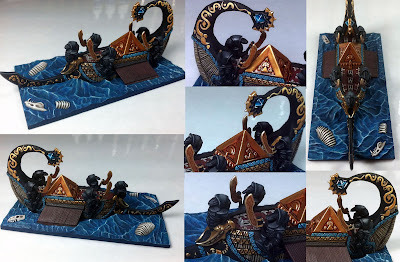 He was also a part of the 2012 Adepticon Charity Dreadfleet painting crew where he painted The Curse of Zandri. .... Man I wish I had won this raffle!!!!!! "There is really not much to say about this model. I was and still am very fascinated about beastmen and I still hope that one day I might be able to build an army… I always saw Nurgle, Khorne and Undivided beastmen but very few Slaaneshi ones. 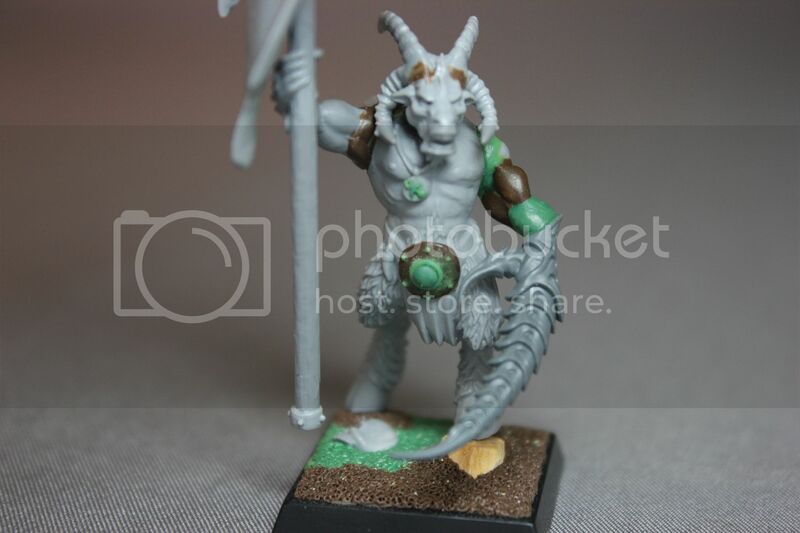 So I figure that this project will let me try some of my ideas for Slaanesh beastmen." I Love just how slick this model is! 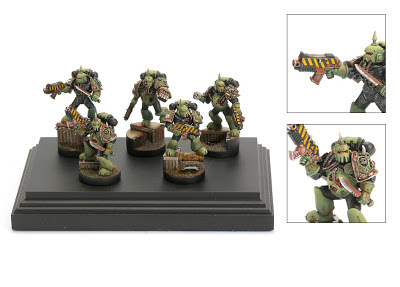 Initially, this model seems pretty straightforward with its daemonette claw and stock stance. What is really great though is how incredibly smooth the sculpted musculature is. The placement, proportion and sculpting style make this claw looks like it was always meant to be there. 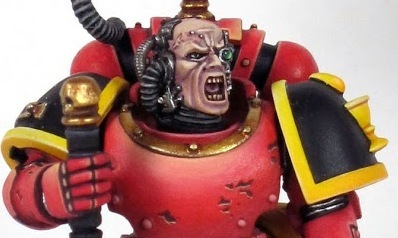 He has sculpted a perfect teeny tiny slaanesh symbol on the amulet hanging from the neck and additionally the belt features six studs around the edge of it - a fantastic subtle addition with six being the sacred number of Slaanesh. The model here has been enhanced - not remade or reimagined - just perfected with a brilliant upgrade of character. 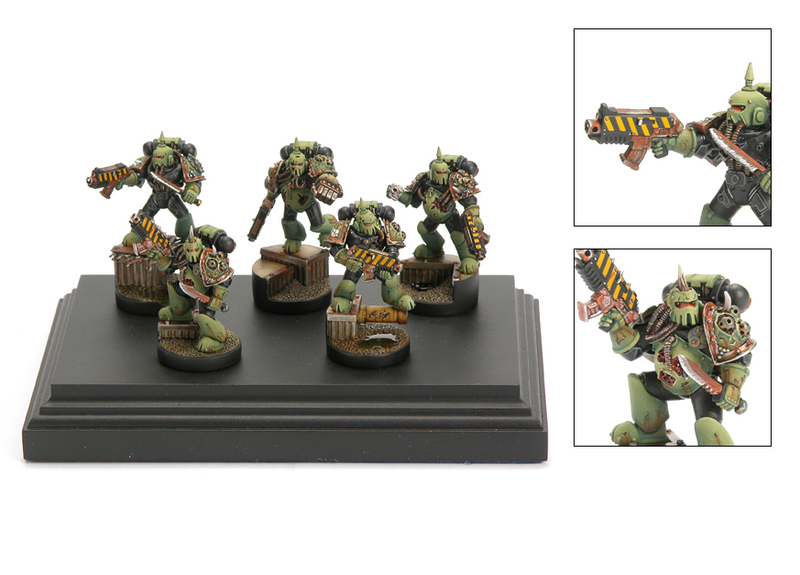 Make conversions look like they belong in the actual GW range - as if they were always meant to be a part of the model. Support the background and character of the piece you are presenting as clearly as you can in the details and modelling. 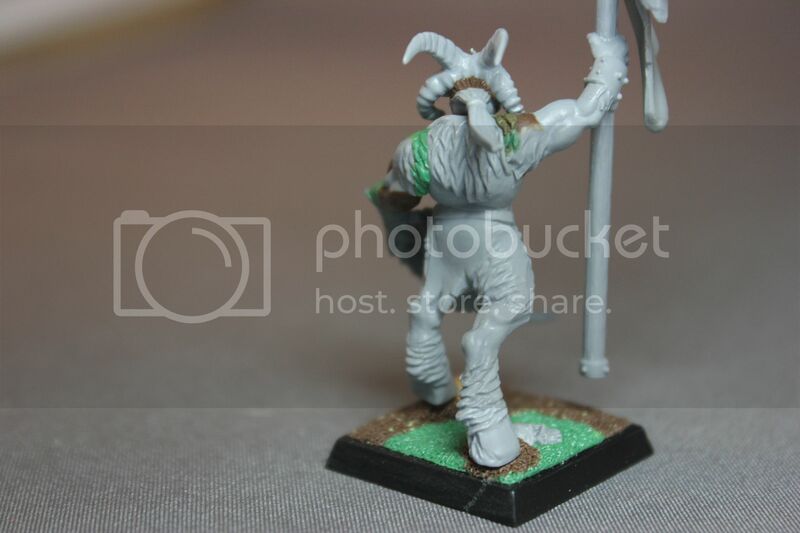 I have decided that because this is a standard bearer AND because it is so different than the other models (which as he noted are mostly Nurgle, Khorne or Undivided looking) I am going to do something a little different with the basing and give it a different role in my army. I have decided that I will mount it on a cavalry base and run him amongst my hounds unit(s). I have always found it kind of strange that the hounds run in organized yet uncontrolled packs amongst the battle lines, so it has always seemed to me that someone ought to be wrangling them, perhaps through more than simple verbal commands..... I like the way that using this character in this way thematically picks up on the idea of Slaaneshi speed and pheromone control. If I am truly going to paint this model up to my army standard, a friend pointed out that the banner demands some creative freehand. I have started brainstorming some designs and will post them here soon for critique and so that you readers can help me choose a design. 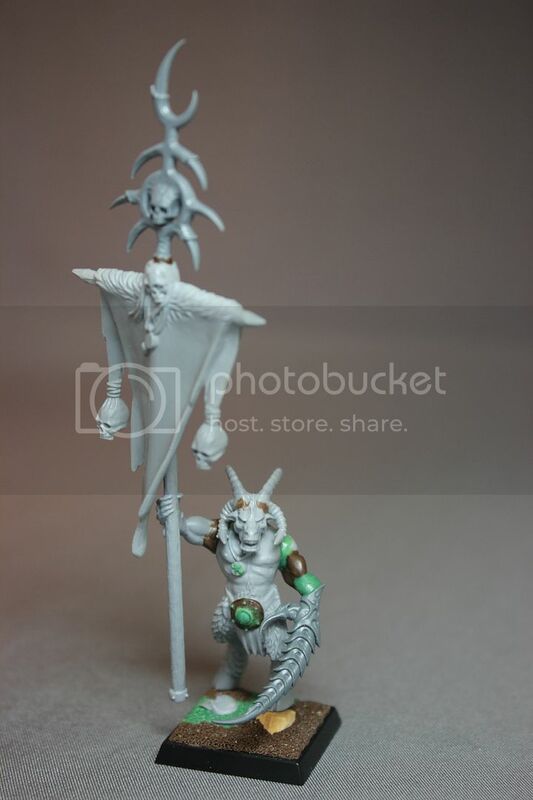 I will then post a step by step of how I actually execute the banner on the model.